At The Duquesne House Inn & Gardens every reservation is important to us. Your credit card will be charged in full at the time you make your reservation. We do understand that sometimes plans change. If you need to cancel or modify your reservation please let us know at least 14 days or more before your arrival date for a refund, less a $25 cancellation fee plus tax. Cancellations of less than 14 days notice are subject to a full charge, unless we are able to re-book the room, less a $25 cancellation fee plus tax. Check-in is preferred between 4 to 6pm. If you are arriving any later, please let us know in advance. We are happy to accommodate check-ins as early as 3pm when possible. Waters are complimentary upon arrival. Other amenities are for in-room use only. Any damages, broken items or amenities, linens or decor items taken from the room will be charged to the credit card on file. Our suites are strictly non-smoking. Smoking is ONLY permitted outside in the back corner fire pit area of the garden. An ashtray and matches are provided for your convenience. We understand how difficult it is to leave your furry friends behind. However due to our own allergies and out of concern for other guests, we do not accept pets or service animals. Please explore www.patagoniaaz.com to locate pet friendly accommodations in the area. Children are always welcome at our Inn. Please contact us for rates. Please call or email us if you would like to purchase a gift certificate. Gift certificates may be used at any time and have no expiration date. Please call or email us if you are making a reservation with a gift certificate and be sure to have your gift certificate with you at check-in. Built in 1898 by the founder of the town, Rollin R. Richardson, The Duquesne (pronounced Du-cane) Bunkhouse, as it was known, was originally an adobe boarding house for miners working in the Patagonia Mountains. Over the decades that followed, it passed through the hands of several local families until it was lovingly renovated beginning in the 1970s. 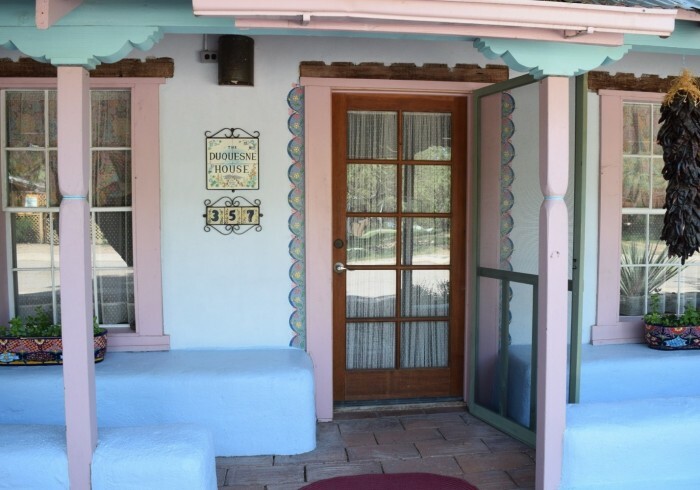 It was reborn as The Duquesne House Bed & Breakfast in 1989. Many local artists and artisans creatively evolved the space in the years that followed. It changed hands in 2003 and the new owners continued its marvelous transformation. In 2015 we became the proud owners and caretakers of this historic Patagonia landmark. In honor of the deep roots the building has here and the amazing gardens on the property, we now call it The Duquesne House Inn & Gardens.